If you're like me and ate about 4 pounds of chocolate over the holidays, the shape of your belly might be needing some attention. Along the lines of over-indulgence and trying to make amends with the consequences that ensue, I've gone back to a bi-daily routine of going through a series of yoga postures. This is not to lose the extra pounds from over-eating and under-moving, but to get back in touch with how my body feels when it moves intentionally and slowly in very grounding postures. 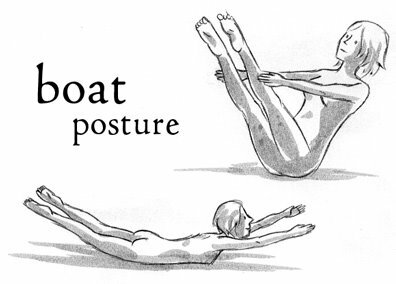 The Boat posture is particularly challenging because you need to use your stomach and back muscles to hold up the rest of your body. In the seated version, you start by sitting upright with your feet on the floor and your hands by your hips on the floor. Tighten your very lower abdomen (think of your uterus, ladies), lean back 45 degrees with a very straight back, raise your arms parallel to the floor and to each other, and then raise one shin to be parallel to the ground, then the other shin, knees together. That should be hard enough, but if you want more, straighten your legs like in the picture. Breathe deeply and steadily for 5 counts, making sure not to hunch, then rest, and repeat 2 more times. The prone version of the Boat posture is slightly easier but still a good effort. Start by lying on your belly, all limbs relaxed. Inhale and bring your hands above your head along the floor. Breathe steadily. On an exhale, lift and extend your hands and feet away from your body as if there's a person at each end pulling your limbs up and away. Take 5 deep breaths like this, then relax. Enjoy relaxing. And do it 2 more times. Yay! I'm so excited you've got a blog! Now I can keep up to date on what you're up to without having to use my psychic powers! Did you know that you can create short urls with AdFly and get dollars from every visitor to your shortened urls.